Emily and I watched United Artists' Valkyrie last night. The drama and suspense of the failed July 20, 1944 assassination plot against Hitler, along with the deep questions of conscience, bravery, sacrifice and resolve that such a story entails, have certainly given this film a lengthy lingering period in my mind. (1) I was stunned to learn that Hitler survived fifteen German assassination attempts. (2) It was striking to hear Hitler proclaim, in the radio address after the July 20 Plot had been unsuccessful in its mission, "I remain unharmed. Providence is certainly with me." What a strange idea (for us) to think that God was in favor of Hitler's actions. Hitler, though, seemed convinced. How could Hitler think God honored his actions? Yet, how often do we mistake our own temporary prosperity as an indication of God's favor? 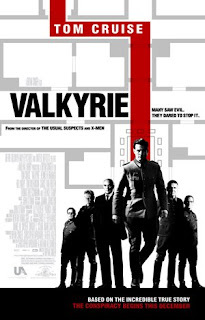 (3) Though Valkyrie doesn't make this point, I was interested to learn that Dietrich Bonhoeffer was ultimately executed for his connection with the same group of high-ranking military officials that executed, unsuccessfully, the July 20th assassination attempt. (4) Although not necessarily true to history, I was fascinated by the scene where Colonel von Stauffenberg moves the Reserve Army to Berlin and begins to arrest all of the SS officers to prepare for the new regime. It seemed as though many government officials didn't really even care what side they were on, and for the moments while it seemed that Hitler was dead, it was quite revealing of human nature to see this portrayal of a mindless change of allegiance. Mostly it seemed like the majority of people just would give obeisance to anyone, so long as they could keep their head in return. This scene requires sober personal contemplation.